Sales climbed to 19,586 compared with 17,050 a year earlier. Year to date, sales rose to 135,823 compared with 125,797 in the same year-ago period. “The year-to-date gain of 8% was a little stronger than we expected to see things at, right now, but you do tend to see a weaker second half in the medium-duty space,” ACT Research Co. Vice President Steve Tam told Transport Topics. ACT has forecast U.S. medium-duty sales will reach 250,000 units this year. Class 7 sales rose 11.5% to 6,131. The Freightliner and International brands were in a dogfight for the leading market share — with Freightliner earning a 38.6% share and International 37.2%. Freightliner is a brand of Daimler Trucks North America. International is a unit of Navistar Inc.
Paccar’s two brands, Kenworth Truck Co. and Peterbilt Motors Co., earned 18.4%. 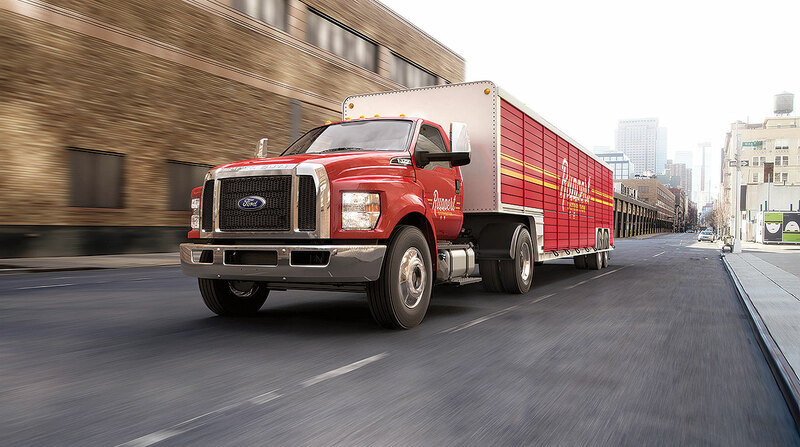 Class 6 sales jumped 33.9% to 5,898 amid the typical battle for share among Ford Motor Co. with 2,005 sales, Freightliner with 1,848 and International with 1,095. Class 4 and Class 5 combined for sales of 7,557, up 5.8% compared with the 2017 period. In related news, Isuzu Commercial Truck of America Inc. announced it has produced the 50,000th gasoline-powered Isuzu N Series truck in Charlotte, Mich. Assembly of the truck began at Spartan Motors Inc. in April 2011. It was the first gasoline-powered low cab forward truck available in North America. The N Series includes a Class 4 with an option for a crew cab. The gas-powered trucks feature a Vortec 6.0-liter small-block V8 engine that produces 297 horsepower at 4,300 rpm and generates 372 pound-feet of torque at 4,000 rpm, which Isuzu reports is the most torque of any gas-powered LCF truck in North America.